Country: Scotland | Beer Apprentice - Craft Beer News, Reviews, Interviews and Info. Review of Traquair "The Laird’s Legacy"
Hi folks. For today’s drinking pleasure I’m going to be trying the Traquair “The Laird’s Legacy” brewed by the Traquair House Brewery Lld located in Peeblesshire, United Kingdom (Scotland). I’m still on the fence when it comes Traquair’s products. I’ve had some that I thought were great, however I’ve had others that were not as fun to drink. I’m eager to see how this one stacks up. The Laird’s Liquor is a rich dark ale with a hint of liquorice perfect for winter evenings. Let’s just try it for ourselves and see what it’s all about. It came in an 11.2 oz. bottle with an ABV of 6.0%. The beer poured a relatively clear, dark brown, ox blood to burgundy color with highlights of burnt yellow, orange and a sheen of ruby around the edges. The head was off white, kind of smooth, but somewhat soapy. The size was average as was the retention time. The lacing was a bit insignificant also. Within the smell I got a bit of “peaty” smoke right off the bat. It smelled very earthy and malty. Some nuttiness (walnut), burnt grains and coffee hints. Maybe a very feeble amount of licorice, but not much really. Light hints of chocolate came through a tad more as it warmed. Actually, this brew smelled pretty good I thought. It had enough aroma to keep me occupied for the duration. The taste gave off a sturdy amount of chocolate. Again, hints of some smoke combined with a woody, nutty and herbal tone. The coffee flavors seemed more relaxed in the taste and the licorice made more of a significant statement than it did in the aroma. Burnt grains and toasted breads gave the savor a bit more depth. All in all, a very nice flavor with this one. The mouthfeel was medium bodied, smooth, slick and silky. It wasn’t quite as dry as I was hoping it might be to tell the truth. The carbonation was “ok” and a decent amount of flavor was left behind on the palate after each sip. Well, we have a pretty good beer here. It was solid all around and it was incredibly easy to drink. The nose had more coffee while the taste presented more of the chocolate and licorice. It’s not quite the greatest beer on the planet, but it’s far from the worst that’s for sure. I found it to be quite enjoyable and fitting on the evening in which I tried it. I would have no problem whatsoever trying The Laird’s Legacy again if it were offered and I would recommend that you give it a try if you see it because it may suit your needs perfectly. Thanks for reading and commenting folks. I truly appreciate it. For today’s craft beer review I’m going to be trying the Traquair Jacobite Flavored Ale produced by the Traquair House Brewery Lld located in Peeblesshire, United Kingdom. I had the Traquair House Ale not too long ago and thought it was a pretty good brew, so I’m hoping that this effort will be just as good if not better. The website, traquair.co.uk, has this description of the Jacobite. This brew has an ABV of 8.0% and comes in an 11.2 oz. bottle. The beer poured a very dark brown to dark burgundy color with ruby red and burnt orange highlights showing through the middle and at the bottom of the glass. The khaki colored head was a little underscored on size; the retention was lackluster and the lacing was only average. 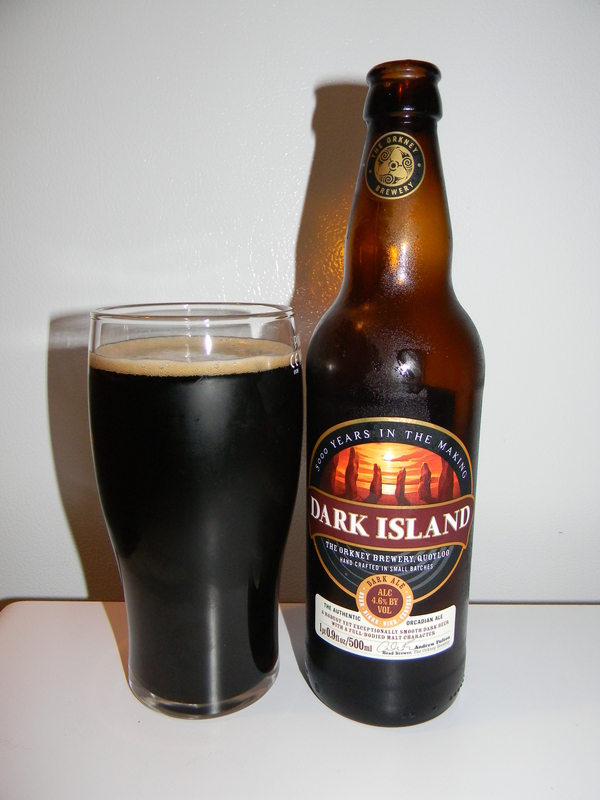 In the aroma I found hints of dark fruit. Plums, prunes and stabs of deep, dark grapes. Further tones of sour dough coalesced with light fragrances of chocolate and coriander. I also found characters of toffee and/or caramel. The aroma was nice and evenly balanced. Within the taste a bit more of the chocolate came through. Slight savors of booze intermingled well with the sweetness of the dark fruits. Spices of coriander and maybe a very mild hint of clove gave the flavor profile a nice bite. Some toffee malt added to the sweetness and helped complete the overall profile. The mouthfeel was medium, dry, incredibly smooth and slick. Silky almost. It left an “ok” amount of flavor behind on the palate, however it did leave a suitable bit of warmth from the alcohol. Well. This beer was just “ok” for me. I can definitely tell that it is a well made brew that deserves respect, but I think it has more to do with this not being a favorite style of mine as to why I didn’t think it was better. I had no problem drinking one, although I’m not sure that I would want to make a night of this. I would suggest giving it a try though. It’s quite a unique brew. 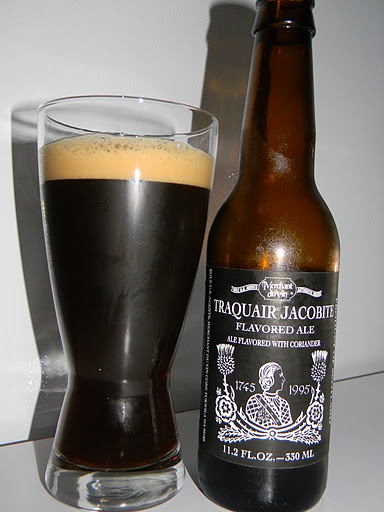 If you have tried the Traquair Jacobite Flavored Ale, be sure to let me know what you thought of it. Thanks for reading and commenting everyone. I truly appreciate it.